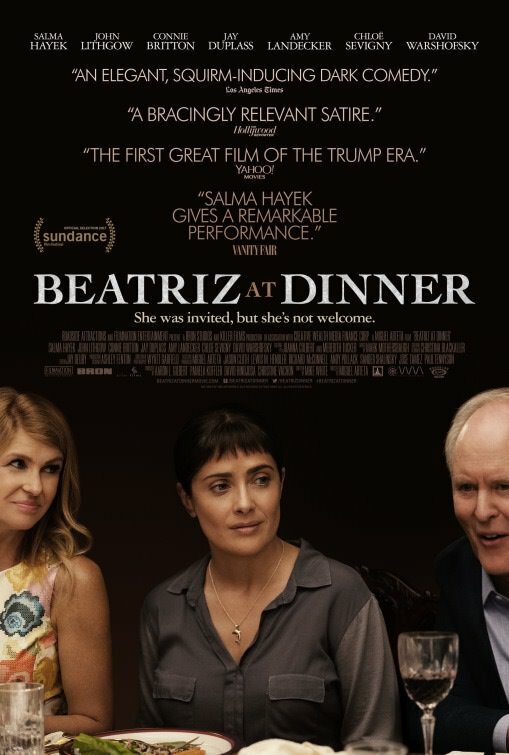 Puerto Rican director Miguel Arteta directs Oscar nominee Salma Hayek (Frida) in an insightful comedy of manners Beatriz at Dinner which also stars Connie Britton, Chloe Sevigny and John Lithgow. Beatriz is a struggling massage therapist, a Mexican immigrant to a California who also works at a Cancer centre in Santa Monica. Beatriz loves animals and is deeply distressed when her goat dies, supposedly killed by a neighbour. After spending most of the day at the Cancer centre she has one last appointment: at the home of a wealthy woman Kathy’s whose plush and spacious residence in a gated community overlooking the Pacific in Newport Beach, California, which proves to be Beatriz’s emotional untangling. Connie Britton from the hit TV show Nashville plays sickly sweet Kathy who initially treats Beatriz as one of her special paid friends even though she is essentially her Mexican massage therapist. Things go haywire when Beatriz’s old car fades on her and she is left stranded at this gorgeous home where Kathy insists she must stay for a very glamorous dinner party. Caterers have been brought in, the Mexican maid is ready to answer the door and the well-heeled guests include ruthless property developer Doug Strutt wonderfully played with that obnoxious temperament by Oscar nominee John Lithgow (Terms of Endearment). Among the other guests are Alex played by Jay Duplass and his fabulous wife Shannon played with the cool American chic by Oscar nominee Chloe Sevigny (Boys Don’t Cry). Kathy’s husband Grant is hosting Doug Strutt to celebrate the ground breaking of a massive property development. As the evening progresses, Beatriz, a cat among the pigeons, sets everyone’s affluent artificiality on edge when she begins questioning their extravagant lifestyles and dubious moral choices. The scenes between Salma Hayek and John Lithgow are particularly illuminating and form the backbone of a razor sharp film about class and socio-political transactional dynamics. About them and us. About Beatriz realizing that in corporate America, ruled by a Trump presidency, there exists ruthless businessmen who will stop at nothing to obtain obscene wealth despite the environmental impact of building commercial resorts and hotels in poverty-stricken paradises like Guatemala and parts of Mexico, which have absolutely no benefit to the indigenous communities. Salma Hayek is sensational in Beatriz at Dinner a return to her dazzling ability to portray eccentric characters like she did as the title role of Frida, director Julie Taymor’s colourful film about the acclaimed Mexican artist and revolutionary Frida Kahlo. Salma Hayek definitely needs to make more arthouse films whereby her unique acting abilities can really shine through. Beatriz at Dinner is a wonderfully poignant film, a gentle reminder that when seated at a dinner table everyone’s true identity is revealed especially after a three course meal coupled with several glasses of Californian chardonnay. Despite the contrived plot device of a broken down car, Beatriz at Dinner is an insightful portrayal of contemporary America and receives a film rating of 7.5 out of 10.